What's the Fremont dinosaur exhibit? The Fremont dinosaur exhibit is yet another interesting part of the Fremont district that has an interesting history. If you're going to spend any amount of time in Fremont, you might was well stop by and see the dinosaurs. 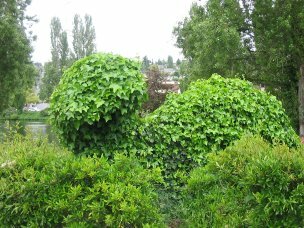 They are located on the corner of 34th Street and Phinney and are the topiary dinosaurs of the area. The two dinosaurs (I think that specifically they are apatosauruses) have ivy growing on them and while you can still see their wire frames, hopefully before too long the ivy will cover the entire bodies. The dinosaurs have an interesting history (but then again, so does everything in Fremont). I'm not exactly sure on how long ago it occurred, but the Pacific Science Center had these two dinosaurs that they wanted to get rid of but nobody wanted them. It was then that a guy by the name of Jon Hegeman (along with a group of Fremont locals) bought the dinosaurs for $1 and transported them over to the area. 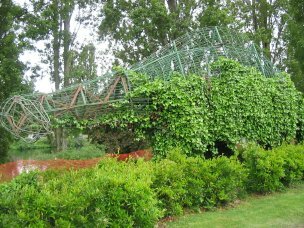 The dinosaurs weigh 5 tons, are about 66-feet long, and need about 7,000 ivy plants to get them going. Even with all that, however, the community got together and hauled the dinosaurs over to Fremont and found a place for them. Supposedly the dinosaur exhibit needed a bunch of work done before they were ready and people came out of everywhere to help out, doing things such as stripping them, rewelding the wire frames, getting rid of the nesting squirrels, and even adding plumbing and electricity. While I wouldn't go to Fremont just to see the dinosaurs, kids would probably get a kick of seeing them if you're in the area (especially if you're there already checking out the Fremont bridge troll or the statue of Lenin). Return from the Fremont Dinosaur Exhibit to Seattle Pop Culture.